With dark oak floors, striking murals and roll-top baths, our 10 quirky bedrooms combine old-world character with contemporary style and are a true reflection of the vibrant market town of Frome. 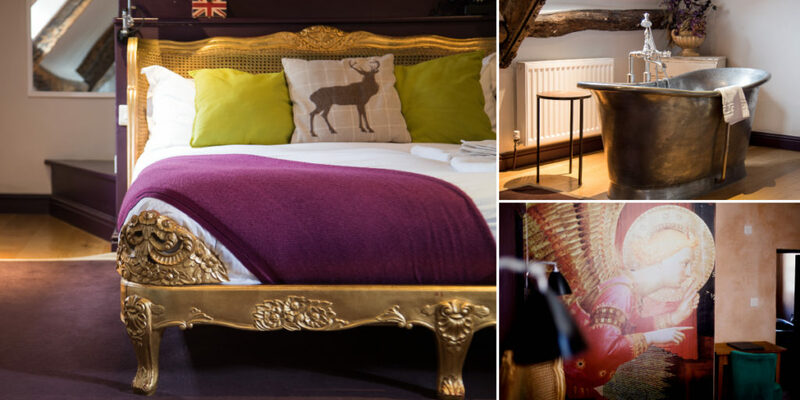 Each of our rooms features every modern convenience and are perfect whether you’re visiting Frome on business or looking to indulge in a stylish and romantic country escape. Please be aware that as the Archangel is a lively bar and restaurant as well as an inn, there is likely to be some level of noise from the bar, restaurant and outdoor courtyard during service hours. Book direct with us for our best rates: just call +44 (0)1373 456111 to speak to our friendly team on or email hello@archangelfrome.com. Each of our four courtyard rooms is dog friendly; if you are travelling with your dog make sure to select a courtyard room and inform our team upon booking. Note that there is a small extra charge of £15 per dog. All our small and large luxury double rooms are found in our main building and feature beautiful roll top bathes. Our standard rooms are available as single, small double and large double room all with en-suite showers. As a 900 year old building in the centre of a thriving town, the Archangel has some eclectic rooms with staircases that can also be a little noisy. If you have any concerns or mobility issues then please do just give us a call and we’ll be happy to help you find the perfect room to match your requirements. All our beds are dressed in sumptuous feather duvets for your comfort but we also have hypoallergenic bedding available on request. Our exceptional menus are produced using locally sourced, top quality and seasonal ingredients.